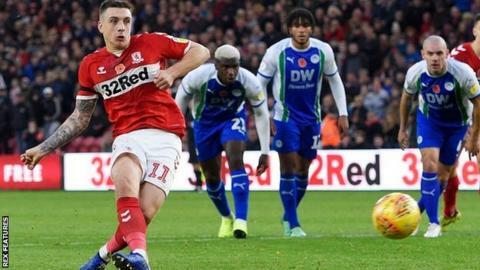 A first-half double from Jordan Hugill sent Middlesbrough back up to second in the Championship with a routine win over Wigan. Hugill opened the scoring from the penalty spot after Cedric Kipre had brought down George Friend in the penalty area before making it 2-0 with a header from Martin Braithwaite's cross. The Latics, playing for the first time since Hong Kong-based company International Entertainment Corporation completed their takeover of the club, improved after the break but sub Callum McManaman's fierce shot over the crossbar was as close as they came. Norwich's late winner over Millwall meant that Boro's first league win since 19 October was not enough to send them back to the top of the table. Boro had drawn their previous three league games but were unlikely to make it a fourth once West Ham loanee Hugill scored his second goal in six minutes just before the break. Hugill's goals were his first in the league since scoring for Preston against Boro on 1 January and he could have scored more but for Wigan keeper Christian Walton's excellent save to deny him an early opener. A fourth straight defeat for Paul Cook's side leaves them just four points above the relegation zone but their improved second-half showing will at least have been some consolation. Tony Pulis' men face a trip to Brentford after the international break, while Wigan host struggling Reading. "I was really pleased that Jordan got the two goals. What people have missed, and I've said it before, is that the lad went from Preston to West Ham and was never involved in any football at all in the Premier League. "Then in pre-season he got an injury, so he hasn't really done anything for six months. He came here really cold, his fitness levels were nowhere near those of the rest of the group, but he's worked really hard and, in the last few games, we've seen some good signs. "The great thing about him is that he's got that little bit of steel about him. He's a local lad and he's desperate to do well for this football club." "You come to places like the stadium today playing against a very strong team, know you're going to have to defend and come under pressure, but from my point of view the goals we're giving away aren't coming from pressure, they're coming from individual mistakes. "It's a sucker-punch. You can make a million excuses, but if you offer good strong teams like Middlesbrough the opportunity to gain confidence you're going to give yourself a mountain you can't climb. "If you make individual errors, as I say with Middlesbrough, they're an excellent side, very strong all over the pitch, they'll cause you loads of problems and when they have to defend they'll defend as good as anyone." Match ends, Middlesbrough 2, Wigan Athletic 0. Second Half ends, Middlesbrough 2, Wigan Athletic 0. Attempt missed. Lewis Wing (Middlesbrough) right footed shot from outside the box misses to the left. Assisted by Britt Assombalonga. Attempt missed. Nathan Byrne (Wigan Athletic) right footed shot from outside the box misses to the right. Assisted by Kal Naismith. James Vaughan (Wigan Athletic) is shown the yellow card for a bad foul. Dael Fry (Middlesbrough) wins a free kick in the defensive half. Attempt saved. George Saville (Middlesbrough) left footed shot from outside the box is saved in the centre of the goal. Assisted by Britt Assombalonga. Attempt missed. Callum McManaman (Wigan Athletic) right footed shot from the centre of the box is just a bit too high following a set piece situation. Substitution, Wigan Athletic. Kal Naismith replaces Gary Roberts. Attempt blocked. Callum McManaman (Wigan Athletic) right footed shot from outside the box is blocked. Assisted by Nathan Byrne. Attempt missed. James Vaughan (Wigan Athletic) header from the centre of the box misses to the left. Assisted by Lee Evans with a cross. Nathan Byrne (Wigan Athletic) wins a free kick in the attacking half. Foul by Danny Batth (Middlesbrough). Substitution, Middlesbrough. Lewis Wing replaces Martin Braithwaite. Attempt missed. James Vaughan (Wigan Athletic) right footed shot from the centre of the box is close, but misses to the right. Assisted by Callum McManaman. Attempt missed. Callum McManaman (Wigan Athletic) right footed shot from the left side of the box misses to the right. Assisted by Antonee Robinson. Substitution, Wigan Athletic. James Vaughan replaces Nick Powell. Foul by Darron Gibson (Wigan Athletic). Attempt blocked. Jonny Howson (Middlesbrough) right footed shot from outside the box is blocked. Attempt blocked. Stewart Downing (Middlesbrough) left footed shot from the right side of the box is blocked. Assisted by Dael Fry. Corner, Wigan Athletic. Conceded by Aden Flint. Attempt blocked. Nick Powell (Wigan Athletic) header from the centre of the box is blocked. Assisted by Lee Evans with a cross. Corner, Wigan Athletic. Conceded by Dael Fry. Substitution, Middlesbrough. Britt Assombalonga replaces Jordan Hugill. Attempt missed. Nick Powell (Wigan Athletic) right footed shot from outside the box is close, but misses to the left. Assisted by Antonee Robinson.